Rip and tear Gracie ! And a new dress too ! Lucky girl… I bet she laughed when dad on the other end of the puppet did the shrill Kookaburra call! Good to see she is maintaining some small vestiage of her Aussie roots. How often does Leakhana get asked if Grace is her baby or similar statements/questions? 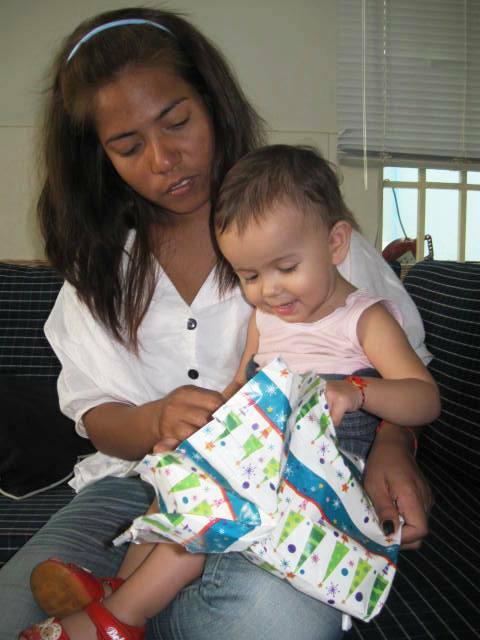 Actually in the beginning when she was taking Grace to Psar Kandal she was asked who she was nannying for all the time ! Now that everyone knows mother and daughter it isn’t so bad. I can see my wife in my daughter every day though and she has her mother’s character too. Is your wife getting same ? Yes my wife constantly gets the same, from people who don’t know her, many think she is the nanny or whatever. Many think she is way way too young to be a mother .. plus Lissa is a barang sized (and looking) baby and Mey is quite petite and asian.